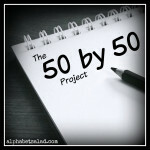 The 50 by 50 Project is a list of 50 things I want to accomplish in the coming year: things I need to do, things I want to do, things I keep saying I’m going to do but never quite get around to it, things that will make me a better person, things that will get me out of the house more, things that will help me get my house in order. Some of the things on my list are big, ongoing, and challenging while others are short, sweet, and easily accomplished. Some are serious, others are frivolous. Some are tedious, others are a delight. All are realistic, doable, and life-enhancing. The intent of the project isn’t to somehow attain perfection by the age of 50 (if that were even possible! ); rather, as Peter suggested when I explained the project to him, to hit the ground running when I reach that milestone, happy and healthy and ready for a vibrant, fulfilling life to come. I wrapped up the post by committing to write a monthly “Progress Report” (usually toward the end of each month) with updates on how my 50 by 50 Project is progressing. I shared my first progress report at the end of January and followed up with the second in February, the third in March, the fourth in April, the fifth in May, the sixth in June, and the seventh in July. Time for my eighth progress report! 7.1 lbs lost as of 2016-01-25. 5.5 lbs lost in February, total 12.6 lbs lost to date in 2016. 6.6 lbs lost in March, total 19.2 lbs lost to date in 2016. 4.4 lbs lost in April, total 23.6 lbs lost to date in 2016. 5.5 lbs lost in May, total 29.1 lbs lost to date in 2016. 2.9 lbs lost as of 2016-06-20 (I was out of town for my weigh-in on the 27th), total 32.0 lbs lost to date in 2016. 3.1 lbs lost in July, total 35.1 lbs lost to date in 2016. 4.2 lbs lost in August, total 39.3 lbs lost to date in 2016. Read 50 books for the 2016 Outdo Yourself Reading Challenge. 5 books finished in January, 3 currently on the go. 8 books finished in February, 3 currently on the go, total 13 finished to date in 2016. 8 books finished in March, 4 currently on the go, total 21 finished to date in 2016. 4 books finished in April, 5 currently on the go, total 25 finished to date in 2016. 10 books finished in May, 6 currently on the go, total 35 finished to date in 2016. 2 books finished in June, 5 currently on the go, total 37 finished to date in 2016. 5 books finished in July, 5 currently on the go, total 42 finished to date in 2016. 3 books finished in August, 6 currently on the go, total 45 finished to date in 2016. Within my 50 books read, include one from each of the 24 categories in the Read Harder Challenge 2016. 5 books finished in January, 2 currently on the go. 5 books finished in February, 1 currently on the go, total 10 finished to date in 2016. 1 book finished in March, 2 currently on the go, total 11 finished to date in 2016. 0 books finished in April, 2 currently on the go, total 11 finished to date in 2016. 4 books finished in May, 2 currently on the go, total 15 finished to date in 2016. 0 books finished in June, 2 currently on the go, total 15 finished to date in 2016. 1 book finished in July, 2 currently on the go, total 16 finished to date in 2016. 1 book finished in August, 2 currently on the go, total 17 finished to date in 2016. Read and complete the exercises in Drawing on the Right Side of the Brain (book and workbook). Create art for a colouring book. Sketchbook purchased, 1 page finished in February. 2 pages finished in March, total 3 finished to date in 2016. 6 pages finished in April, total 9 finished to date in 2016. 2 pages finished in May, total 11 finished to date in 2016. 0 pages finished in June, total 11 finished to date in 2016. 2 pages finished in July, total 13 finished to date in 2016. 5 pages finished in August, total 18 finished to date in 2016. Purchase 12 (i.e., one per month) items from friends with online shops. Purchased Hand-drawn: Pysanky-inspired Coloring from Amy Romanczuk Art. Purchased Geometric Colors Spiral Notebook from Barbara Storey. Purchased Pink roses Photographic Print from Sarah Minchin. Purchased greeting cards and stickers from Cat Graham. Purchased Reflection in Street photo print from Neil Kramer. Purchased Elbow-Length Fingerless Gloves – Crochet Pattern from Bonnie Groening. Purchased 3D Tangle: Shading on Black Tiles – “Glow on the Dark” from Eni Oken. Purchased Custom Handmade Vinyl Moo Square Card Holder from Dear Sukie (Kristy Clarke). Promote 12 (i.e., one per month) friends’ online shops on social media. Promoted Hand-drawn: Pysanky-inspired Coloring and Amy Romanczuk Art. Promoted Geometric Colors Spiral Notebook and Barbara Storey. Promoted Pink roses Photographic Print and Sarah Minchin. Promoted greeting cards, stickers, and Cat Graham. Promoted Reflection in Street photo print and Neil Kramer. Promoted Elbow-Length Fingerless Gloves – Crochet Pattern and Bonnie Groening. Promoted 3D Tangle: Shading on Black Tiles – “Glow on the Dark” and Eni Oken. Promoted Custom Handmade Vinyl Moo Square Card Holder and Dear Sukie (Kristy Clarke). Learn to play “Morning Has Broken” on the piano. Purchased sheet music for piano (which includes guitar chords as I’m hoping Peter will join me!). Make a video of me playing “Morning Has Broken” and upload the video to YouTube. Buy and set up a bookshelf in my arts & crafts room. Purchased a bookshelf and am hoping to assemble it and get the room organized this weekend. Done! Assembled bookshelf and a new marker/paper organizer and tidied/organized the whole room. Display my art for sale in a public place. Made a significant dent in the project, and also set up a weekly reminder in my planner to organize the most recent photos into albums, add tags, etc. (so that maybe this time I’ll stay on top of the situation!). Reorganize my iTunes music library. Make a new $25 contribution to Kiva. Oops! I actually made my new contribution in March (to Grupo Las Cruces Santo Domingo Group), but completely missed noting it in last month’s update, so am adding it now. Sort through clothing; organize/repair/discard/donate as necessary. Sort through shoes; organize/repair/discard/donate as necessary. Sort through bags and purses; organize/repair/discard/donate as necessary. Sort through accessories (scarves, gloves, etc. ); organize/repair/discard/donate as necessary. Started – winter stuff only so far. Sort through jewellery; organize/repair/discard/donate as necessary. Planning to get the ball rolling by having passport photos taken this coming Monday. Done! Photos taken (predictably bad, but better than the previous one! ), renewal application submitted, and new passport received a week later… so I’m good for another ten years! Purchased a package and set up an account on Canadian Legal Wills, but haven’t yet completed any of the forms. Done! Last Will and Testament, Power of Attorney, Ontario Living Will, and Funeral Wishes documents completed, printed, signed, witnessed, and filed away until needed (which will hopefully not be for several decades at least!). Make a financial contribution to the Syrian Refugee Crisis. Done! We chose to split our donation between Multicultural Council of Windsor and Essex County (local) and Canadian Council for Refugees (federal). Set up a WEVolunteer profile and find a way to give back to my community. Done! Profile registered; currently considering a very intriguing volunteer opportunity and trying to decide if it’s something I’m willing and able to commit to completing. Instructions and supplies have been assembled in preparation for learning. Done! While I still need a LOT of practice, I did create my first ZenGem and will be sharing a photo in my next Tangled Tuesday post. Visit the Art Gallery of Windsor. Done! Had a really enjoyable time and will definitely return for a future visit. Host a craft/project night for friends at my house. Done! And it was wonderful! Work with Peter to plan and set up a vegetable garden. Well, we’ve thought about it, and we’ve talked about it, but so far that’s the extent of it! We spent some time out in the back yard discussing and planning what we’ll be planting and where things will go. We’ve scaled back our plans and expectations (a LOT!) since it’s our first attempt at a vegetable garden and we’re both a little overwhelmed by the prospect. So far tomato plants have been purchased and Peter is taking care of them. Spend an afternoon taking photos of spring blossoms. They’re not here yet, but soon! Done! I had a glorious time out on my own taking in the beauty of the season and capturing it on camera. Visit Ojibway Nature Centre and Ojibway Park. Take a walk in Jackson Park. Done! I actually visited the park twice, once with Peter and once on my own as part of my spring blossom walk. Host a games night for friends at my house. Working on setting a date that suits everyone. I think we finally have a date that will work, so plans are now in place! The date didn’t end up working, so we’ve put plans on hold for the moment – it obviously won’t take place in the Spring as I’d initially hoped, but it’ll happen this year at least! Complete the training to become a Certified Zentangle Teacher (CZT). Course tuition paid, flights booked, hotel room reserved. Done, and I’m thrilled with it! You can see it at the top of the page on my new website (Laurel Regan, CZT). Have new business cards designed and printed. Designed and ordered and I can’t wait to see them! Done and received and I’m thrilled with them. Create and launch a personal website. Done, and I love it! Go to the beach and walk barefoot in the sand. Visit Uncle Tom’s Cabin Historic Site in Dresden. Host a backyard barbecue for friends. Done – a few of them, in fact! Create a new design for a Christmas/holiday card. Spend an afternoon taking photos of fall foliage. Blog daily with NaBloPoMo (November). Send/give Christmas cards to family and friends. Find a cat-proof (or at least cat-resistant!) way to decorate the house for the holidays. Host a Christmas cookie decorating party for friends at my house. Spend an evening touring the city to look at Christmas lights. Gather with friends to celebrate New Year’s Eve and my 50th birthday. Slight change on this one – since people usually have other plans on New Year’s Eve, I’ve decided to have my birthday celebrations the next day (my actual birthday!). We’ll probably still do something small with a friend or two on New Year’s Eve as well, but my birthday party will be held the next day (and, in the spirit of following up on my 50 by 50 goals, I’ve already posted a note on Facebook requesting that people save the date!). Thank you so much for reading, and I do hope you’ll return and follow along with my Progress – to keep me accountable, to offer support and encouragement, and to be inspired! great going Laurel. I am inspired to do something. Thank you! I’ll be cheering you on! You’ve accomplished a lot (and it is right there in black and white – and green, and red…) kudos! Keep on truckin’! Thank you for the encouragement, Alana! You have inspired me to come up with my own 50 by 50 list. I will turn 50 in January 2018. I have a few months to come up with my list by January 2017. Yay! I’m so glad to have been an inspiration, as this project is proving to be so, SO worthwhile and I’d love to see others jump on board and make it happen for them too. I will be cheering you on!